There it is again! That horrible stink! I retrace my steps, stop in front of the living room window, and sniff the air. The narrow space behind the squat, leather arm-chair is difficult to squeeze into, but that seems to be the only spot in the room I haven’t checked. I tug on the heavy chair with both hands. The dog runs around me in excited circles with a mingled expression of worry and joy. I bet she has something to do with the smell. As I pull it out the dog dashes into the newly revealed space. I only have a second to glimpse a pork chop covered with mold. My mind flashes back to months earlier when we gave it to her. A shudder runs through me as she grabs it, bolts across the length of the house, and disappears out of the back door. I hurry after her, catching up just in time to witness as she swallows the last bite. The sight of my dog licking her snout contentedly, if a bit guiltily, makes me queasy. I am not sure if I should throw up or take the dog to the vet to have her stomach pumped. Surely, in a matter of hours she will die in agony of food poisoning or be sick all over the house. Hmmmm… what a good question! Children are natural scientists. It never stops amazing me what wonderful questions they come up with. Do you know the answer to this question? I didn’t until I did some research. Why T-Rex could eat rotten meat and you can’t. The answer proved to be as straight-forward as most things in a natural world. Scientists looked at 68 modern day mammals and birds and discovered that the stomachs of scavengers, or animals that are exposed to the highest levels of potentially pathogenic (containing germs that can cause some kind of disease) bacteria have higher gastric acidity. Humans have lower acidity than scavengers but higher than herbivores. Herbivores, (cows, kangaroos, llamas) have the lowest acidity because they are exposed to the least bacteria. Another interesting bit of discovery was that today’s scavengers and carnivores have shorter guts than omnivores and herbivores. The shorter the amount of time food stays in the gut, the less opportunity for pathogenic bacteria to multiply! Some paleontologists today go as far as to speculate that T-Rex might have been a gutless dinosaur. They base their opinion on the fact that there seems to be very little room available for guts in the fossils they study. In other words, T-Rex could eat rotten meat because his stomach had more acidity than our stomach and his gut was shorter than our gut (or possibly not even existent). No study is complete without a bit of hands-on exploration. After taking a class in sanitation I’m very squeamish when it comes to raw meat. We don’t eat meat often, but when we do I scrub everything like our life depends on it (oh wait, it does!). But investigation into a world of scavengers and rotten meat calls for raw meat, so it had to be done. I bought three jars of capers. Wait! Capers? Yes, those flower buds of the caper bush that grow in the Mediterranean and can be eaten. From the moment I laid my eyes on a jar of capers at a grocery store, I knew I had found perfect equipment for our science experiments. Those jars are made of clear glass, close tight and are just the perfect size. If you have very young kids who are still learning the scientific method, you might want to use this experiment to practice and start developing these skills. Tell them to clearly define the one question they want to answer with this experiment. And challenge them to make a hypothesis (a testable answer to their question) and form a prediction or two. My kids predicted that meat in high acidity jar will show few (or no) signs of rot and that meat in the low acidity jar will be covered in mold and show other signs of rotting. After you test your hypothesis with the experiment, don’t forget to analyze the results, draw conclusions, and talk about your findings. Studies show that by allowing kids to talk about findings, they not only learn and retain more, but master the art of putting their thoughts in words and learn to speak more concisely. SAFETY NOTE for Kids: Start by explaining that handling raw meat requires care and attention because it might contain harmful bacteria that can make us sick. Before you begin lay out everything you will need – chopping board, knife, and a fork to transfer meat into jars. Secure long hair back. During the experiment try to minimize the number of surfaces that come into contact with raw meat. Remind kids not to lick their fingers or put their hands in their mouth. When you are done, wash your hands with soap, and scrub every surface and utensil used. Have an adult or older kid cut out three equal pieces of meat. Add or have the kids add 1 tablespoon of vinegar to the first jar. Add ½ tablespoon of vinegar and ½ Tablespoon of water to the second jar. Add 1 tablespoon of water to the third jar. Close all the jars tightly and LABEL them properly. We first labeled the jars 1, 2 and 3, but it was too difficult for kids to remember which one stood for what. So, we changed it to High, Medium and Low for the level of acidity in each jar. Watch for changes. Ask kids for their observations. And remember DO NOT open the jars. Day 7: High acidity sample (all vinegar) is on the left and low acidity sample (all water) is on the right. Note the change of color, size and foam. The middle sample has half vinegar and half water. What color is the meat today? We noticed with time a pronounced difference between the high and low acidity samples. The high sample is white, and a low sample is red. The medium acidity sample is in the middle. What texture is the meat? We didn’t notice any prominent changes like fuzziness and bumpiness, but did see bubbles forming on the surface of the liquid. What is happening to the volume? We were surprised to observe the medium and low acidity meat expanding so much! Mold? We observed no mold on any of our samples! DAY 14: Low acidity sample is cloudy. The meat got darker and expanded in size. There is a visible foam on the surface of the liquid and around meat. Vinegar acts as a natural preservative. It is a strong acid in which very few bacteria can survive. A number of micro-organisms have the potential of making us sick. Our stomachs contain strong acids that are part of our digestive juices, but a scavenger stomach has even stronger acids allowing them to eat food that we can’t. T-Rex was uniquely adapted to the diet it consumed and so are we! To further explore these concepts, research the work of gastroentologists, scientists who specializes in digestion system and it’s disorders. DANGER: When you are done with the experiment, throw it away!!!! Don’t reuse the containers! Don’t open the lid! Rot is so dangerous; you can get poisoned just by smelling it! Stay safe! That makes sense, the less aciditity you have the more likely you would be sick eating food that is off . But the T-Rex’s short gut and high level of acidity meant it could happily chomp on any rotting carcass. Lovely! Hey Buddy!, I found this information for you: "Why T-Rex could eat rotten meat and you can’t". 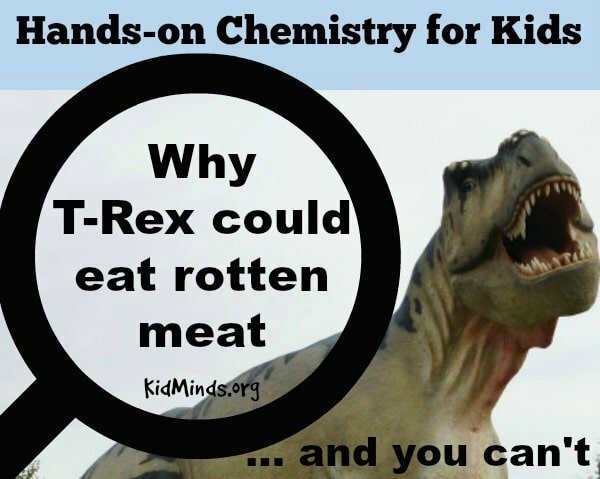 Here is the website link: http://kidminds.org/why-t-rex-could-eat-rotten-meat-and-you-cant/. Thank you.